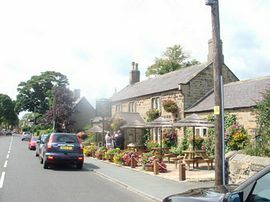 Situated in the pretty village of Lesbury, 1 mile from the coast and close to the market town of Alnwick, we have our beautiful 18th Century cottage. The cottage has been refurbished to an exceptionally high standard, offering you affordable luxury in your stay in Northumberland. The cottage has large, spacious rooms and can accommodate up to 9 people comfortably. 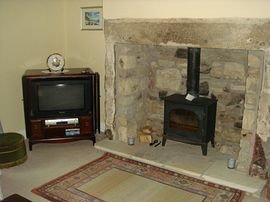 The cottage has a wood burning stove in each of the sitting rooms, making it a particularly cosy retreat out of season. The fitted kitchen comes with all modern appliances to make your stay here, as relaxing as possible. 4 Bedrooms, 2 living rooms and dining room. Large beamed sitting-dining room with a wood burning stove in an inglenook fireplace. Second sitting room, also with a wood burning stove and inglenook fireplace, large flat screen TV, HI-FI system, video player, DVD player and a selection of books and games. Fitted kitchen, with electric cooker, microwave, fridge freezer, dishwasher and automatic washing machine. Bedroom 1 - Double bed with en-suite shower and WC. Bedroom 2 - Double bed and one single bed. Bedroom 4 - 2 single beds. Family Bathroom with bath, whb and toilet. 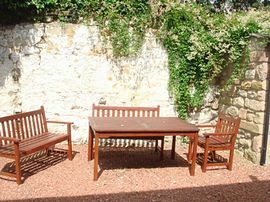 Enclosed patio garden, with garden furniture. Perfect suntrap! Parking is outside the property. All power and bed linen included in the rent. Full gas central heating. 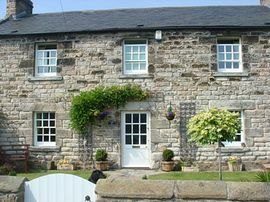 This cottage, in Lesbury makes an ideal central and coastal base, from which to explore Northumberland and its local attractions. For your conveniece, a welcome pack consisting of basic essentials will be provided. Our bookings operate from Saturday to Saturday. Arrival time: 3pm, Departure time: 10am.